I have long been interested in paper crafts and quilling always caught my eye with its gorgeous details. 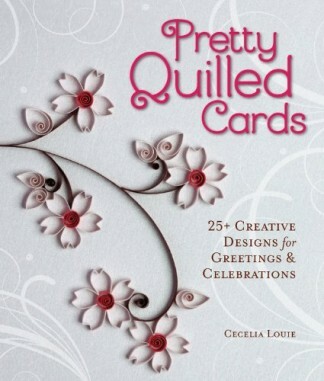 In Pretty Quilled Cards they show lots of different ways to decorate greeting cards, which I think really adds a personal touch and lets people know you care more than just a store bought card. I also make a lot of party supplies and I love how quilling look on treat toppers or gift tags! Since I am a beginner I really appreciated how easy it was to follow along and know exactly how long to cut each piece of paper. I used their image of the finished quilled project and placed my paper right on top of them and that really helped. The project I’m working on now is the birthday cupcake, it’s really simple, but also totally sweet! My goal is to work up to the dragonfly, it looks amazing. Or the framed name, I’d like to make that for my daughter. I’m having a lot of fun with this book!